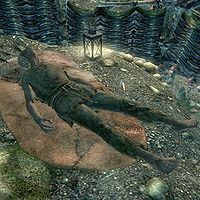 Firir is a Redguard farmer found dead in Chillwind Depths after chasing a lead on a brutal assault on a merchant caravan. He wears only a roughspun tunic with no shoes, and carries at least 25 gold. A torn note is found on his body in the cave, apologizing for his death to his love, Eydis. It is unclear if this is the Eydis at Old Hroldan Inn, as her "missing" husband is claimed to be a soldier and not named at any point. Additionally bringing the note to Eydis has no effect. Firir has the FemaleCommoner voice type. This results in a female voice if the body is resurrected. This page was last modified on 31 July 2017, at 18:08.